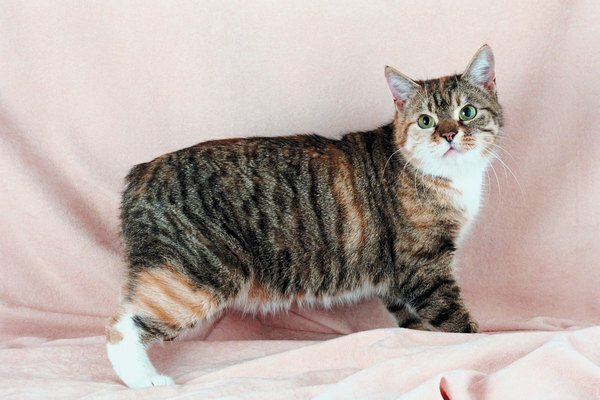 The tailless Manx is known as the rumpy. If you'd like to share your home with a short-tailed feline, your natural choices are the Manx and a relatively new breed, the American bobcat. Both breeds are smart, friendly, and full of personality. "Doglike" is a backward compliment used to describe them both. The original Manx cat hails from Britain's Isle of Man. Although the breed's origin is lost in the mists of time, the Manx's taillessness results from a dominant genetic mutation that flourished in the isolated Isle of Man cat population. The mutation also presents health issues. Manx mothers give birth to small litters. Manx kittens, even those with two tailless parents, can be born with tails. It's not unusual for a litter to contain tailed and tailless kittens. Finding a pet-quality Manx kitten, one with a tail, is easy. Finding a show-quality tailless kitten is another story. Development of this short-tailed breed began in the late 1960s, dating from a mating of a short-tailed tabby to a female Siamese. According to the International Cat Association, the breed's foundation stock comes from feral cats with natural short tails, but they no longer serve in breeding. Because of the limited gene pool, outcrossing to other breeds is still permitted, although not to Manx cats. While a rumpy Manx has no tail, the "rumpy riser" has only a tiny bone where a normal tail would appear. "Stumpies" have short tails, "longies" have tails indistinguishable from those of other cats. The downside is that the gene that produces taillessness also frequently cause spinal deformities such as spina bifida. Affected cats are paralyzed in the back end and might not have control of their bladders and bowels. Breeders usually euthanize such kittens. Most American bobtails, meanwhile, have very short tails rather than no tail. While short-tailed bobtails are usually healthy, those born without tails can suffer from some of the same issues affecting the Manx. Tailless bobtails are not eligible for registration for this reason. The Manx is a double-coated breed, so whether a specimen is long- or short-haired, his fur is very dense. The long-haired version is known as the Cymric. Originally, only long-haired cats were accepted into the American bobtail registry, but that is no longer the case. Both types come in a variety of colors. Other than tailless, "round" is the operative word for the Manx. They possess round heads, round eyes and round cheeks. Their back legs are shorter than the front legs, so Manx cats move in a sort of bunny hop. That doesn't preclude them from jumping -- in fact, the breed is known for its ability to successfully make great leaps. The American bobtail is somewhat larger and big-boned, although late to mature. He's a solid, graceful animal. What Causes a Cat to Have an Unusually Short Tail?